Is anyone else out there in utter shock that it’s already August? The sun is setting just a bit later every night, the first ripe blackberries of the season are appearing on the wild bushes all over my island, and yesterday I came home from a two-day trip to find my vegetable crisper overflowing with zucchini. It’s common knowledge that this is the time of year when every garden-owner is up to their ears in zucchini. Although my family doesn’t have a garden of our own we happen to be the lucky neighbors of a fantastic (and generous) gardener who likes to share. And who happens to be up in her ears in zucchini, of course. Works for me! While I love zucchini in many of its savory forms, including stuffed zucchini, grilled zucchini, roasted zucchini, you name it, I am of course partial to using it in my baking. It adds so much moisture, texture, vitamins and nutrients to baked goods without making them taste like a salad, and it’s so easy to use. Just pull out your cheese grater (or food processor) and shred away. Shredded zucchini can be frozen for later use, which is a definite plus for those overwhelmed zucchini-growers, but my zucchini stock never makes it that far. Not with my baking addiction being as it is. 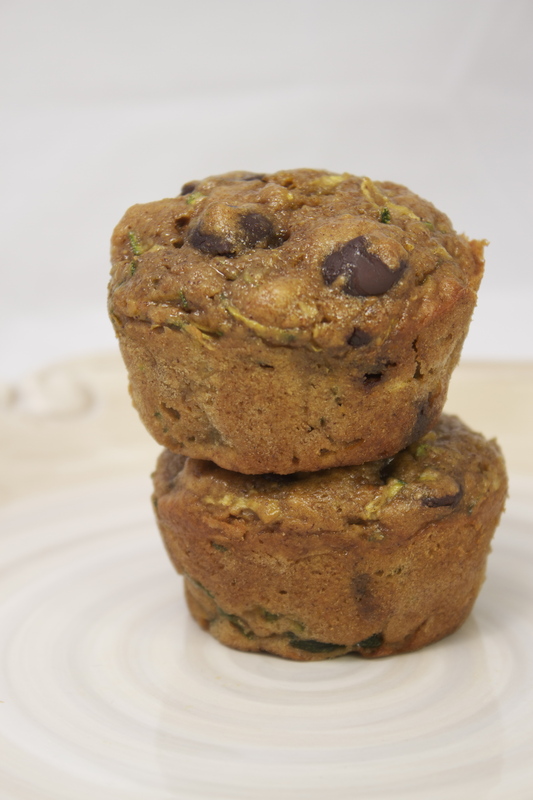 First up on the zucchini list were Whole Wheat Zucchini Chocolate Chip Muffins. 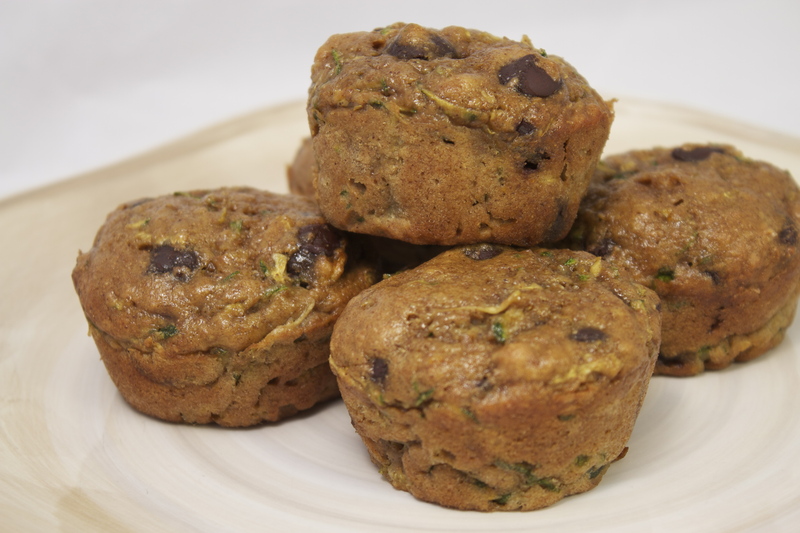 Usually when I make muffins (with a few exceptions, of course) I like to make them relatively healthy so that I can feel just a bit less guilty while serving them for breakfast. So naturally, there’s nearly a cup of chocolate chips in this recipe. Hah. But aside from the much-needed dose of dark chocolate (which I totally condone, even at breakfast), these are nearly guilt-free. They contain NO butter or oil, instead relying on applesauce, eggs, and zucchini to keep them moist and hold them together. There’s only 1/3 cup of refined sugar in the whole batch, and the nutritional content is boosted further with the addition of whole wheat flour and, of course, zucchini. 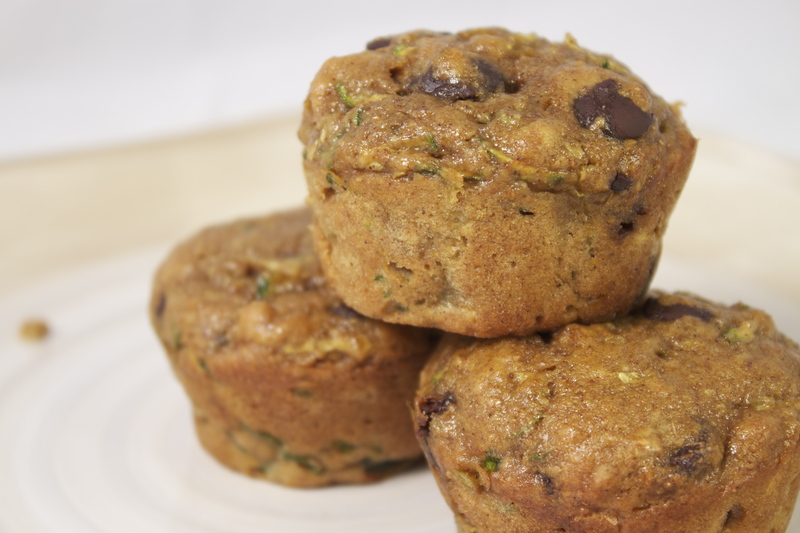 Orange zest and cinnamon serve to give the muffins wonderful flavor in a healthy way, and while these are plenty sweet they taste like real food, not like the sugary cupcakey muffins that so many of us are used to. If you need a way to use up a bit of zucchini, definitely add these to your list. 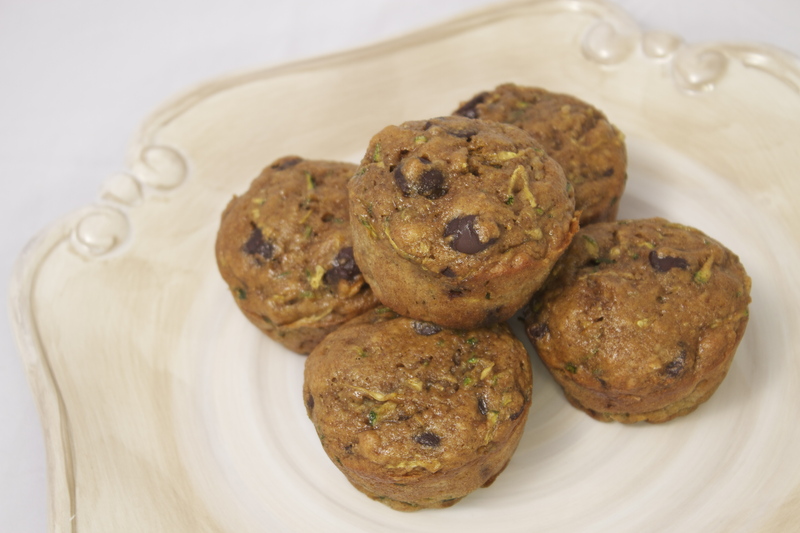 I mean, who wouldn’t want to eat zucchini in the form of a tender, flavorful, considerably healthy muffin containing a hint of fresh orange zest and warm cinnamon? And did I mention that every bite contains rich dark chocolate? That alone should have you running to the kitchen right now! Preheat oven to 350 degrees Fahrenheit. Line a 12-cup muffin tin with paper liners or spray well with baking spray. In a small bowl, whisk together the flour, salt, baking soda, baking powder, and cinnamon. Set aside. Place the brown sugar in a medium bowl. Add in the orange zest and use your fingers to incorporate it into the sugar. When the mixture is well-combined and fragrant, whisk in the honey or molasses, applesauce, eggs, and vanilla until smooth. Gently stir the flour mixture into the wet ingredients, mixing just until no flour streaks remain. Stir in the shredded zucchini and chocolate chips. Scoop the batter into prepared muffin cups, filling each about 3/4 of the way. Bake for 20-24 minutes or until tops bounce back when touched and an inserted toothpick comes out clean. Let the muffins cool for 5 minutes in the tins, then remove to a cooling rack. Store leftover muffins in an air-tight container at room temperature. 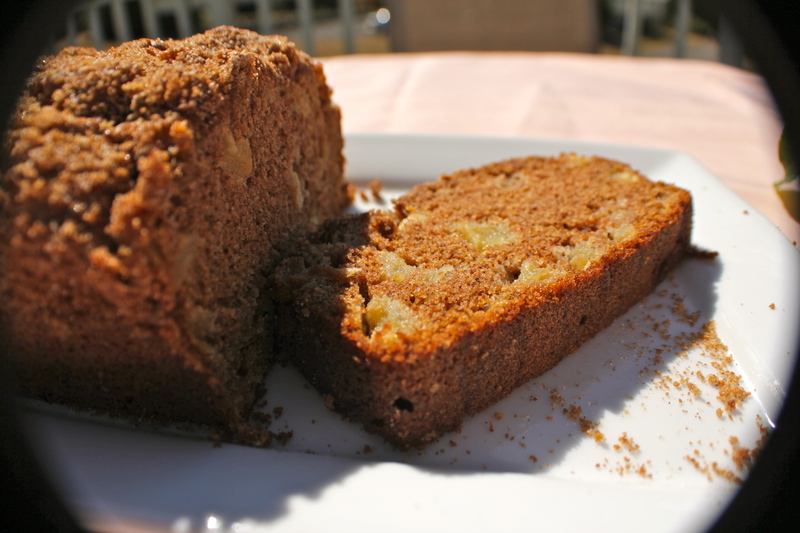 *To make zucchini bread, pour the batter into a greased and floured 9″x5″ loaf pan. Smooth the top and bake for 50-60 minutes or until an inserted toothpick comes out clean. Cool for 15 minutes before inverting onto a cooling rack, then allow the bread to cool completely before slicing. To use a much-hated cliché, there are two kinds of people in the world: breakfast-lovers and breakfast-haters. I know many people whose favorite meal of the day is breakfast, who love everything from pancakes to eggs to bacon, who savor their morning meal like no other. I’m also aware that for some people, breakfast is their nemesis. Whether it’s because they like to sleep right up until 5 minutes before they have to leave for work/school, because they have zero appetite so early in the morning, or because they simply can’t stand having to put a meal together first-thing, those in the breakfast-hating category have some reason or another to steer clear of “the most important meal of the day,” as it’s so often labeled. 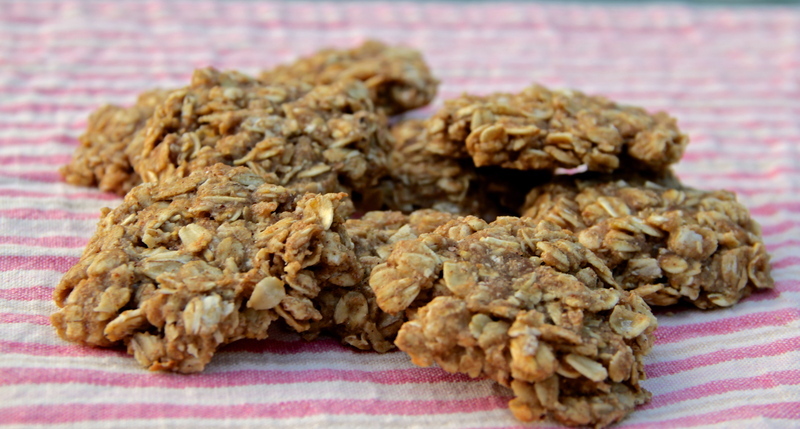 Speaking to the members of both camps, I think you’ll like this little recipe for Maple-Oatmeal Breakfast Cookies. They’re not nearly as sweet as most cookies, instead getting their wonderful flavor from nutty toasted oats and pure maple syrup. The cookies manage to be both chewy and crunchy at the same time, with crisp edges and soft centers. Made with ingredients that you most likely already have in your cupboard, they took no time at all to mix up. Those of you who read my blog regularly know that I don’t usually share nutritional information for my recipes (mainly because I don’t know it myself and don’t want to take the time and energy to calculate it…plus I prefer to bask in ignorance concerning the unhealthier treats on here ;)), but since these are so minimal in the ingredient department and so much healthier than other cookies I figured I might as well boast their low-calorie, low-fat, low-sugar qualities. Finally, a cookie you can (justifiably) eat for breakfast! 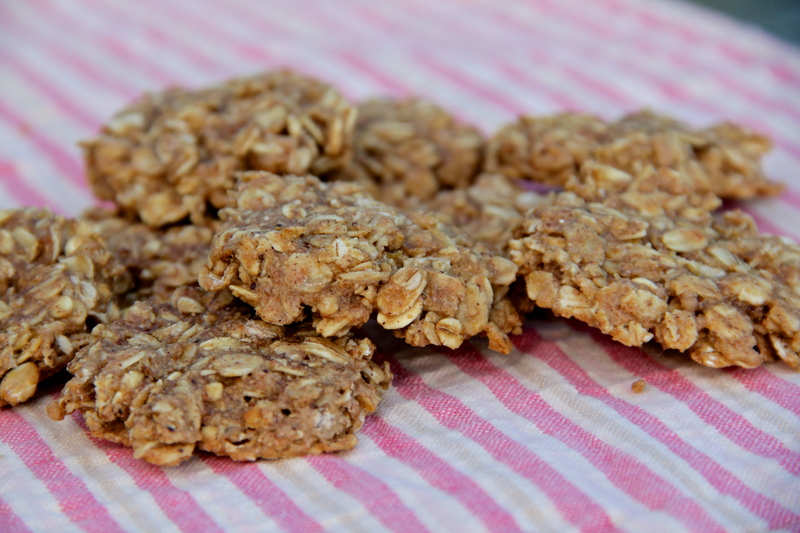 Breakfast-lovers will hopefully add these cookies to their arsenals, and I urge you breakfast-haters out there to bake these up and keep them on hand for a boost of energy in the morning. I find it hard to believe that even the most ardent of breakfast-loathers could resist these Maple-Oatmeal Cookies! Preheat oven to 350 degrees F. Place the oats in a large, wide skillet. Cook over medium-high heat for 3-5 minutes, stirring frequently, until oats are fragrant and golden. Let the oats cool for a few minutes. Place the toasted oats into a large mixing bowl. Stir in the flour, cinnamon, nutmeg, and salt. In a smaller bowl, whisk together the applesauce, oil, maple syrup, and vanilla. Stir the maple mixture into the oats until well-combined. Drop the dough by rounded tablespoons onto lined or greased cookie sheets. With wet fingers, slightly flatten the dough. Bake for 14-16 minutes or until cookies are golden-brown. Let cookies cool on the sheets for 3 minutes before transferring to a cooling rack. When I was little, I had a bit of a sweet tooth. Actually, it was more like a saber-tooth-tiger-sized sweet tooth, meaning that if I could I would inhale every piece of sugar that came my way. Lucky for me I had the metabolism of a hummingbird and two parents whose idea of treats was honey sticks, organic rice pudding, and homemade fruit juice popsicles. Maybe it was because we only had junk food on special occasions (Jell-O when we were sick, Starbursts when we went to the movies, Dove Bars when my grandparents visited) that I was unstoppable when supplied with sugary treats. Whenever we stayed at hotels, I always took full advantage of the complimentary breakfast, piling my plate high with danishes, cinnamon rolls, muffins, and whatever other sugary carbs were available in the little plastic display cases. It was another one of those special occasions I so looked forward to. My parents used to worry about what would happen to me once I grew up and moved out of the house. I think they pictured me going walking into the grocery store and having free reign to buy whatever I felt like, and that was a terrifying image at the time. They needn’t have worried, because now I’m much more sensible. I sample what I bake and eat some candy, but for the most part I stay away from overly-processed, corn-syrup-ridden junk. Moderation is my motto, and my parents no longer fear that their only daughter will become a walking block of sugar–I do most of our grocery shopping, too, and I can promise it’s all quite healthy…for the most part ;). 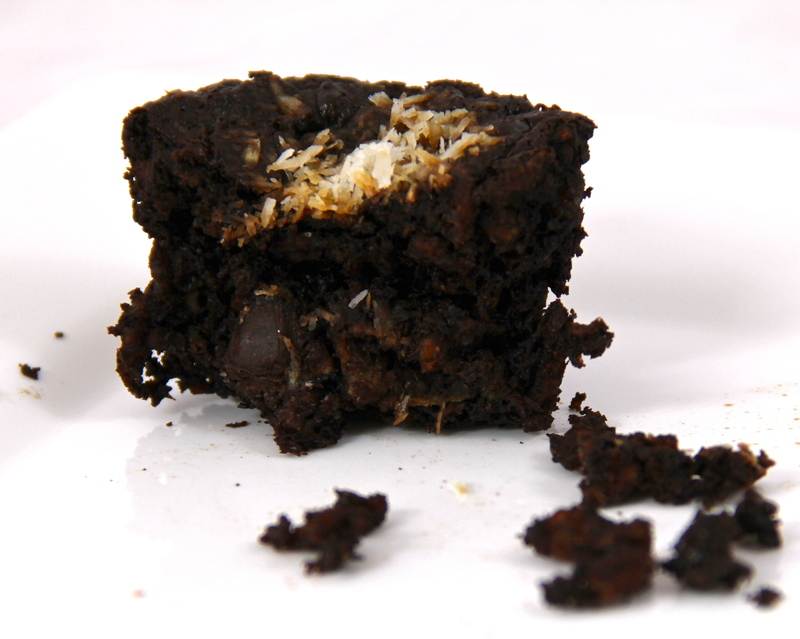 However, for those of you that still have insatiable sweet tooths (sweet teeth just sounded weird), I have a chocolatey treat that I think you’ll love…and your waistline will love too! 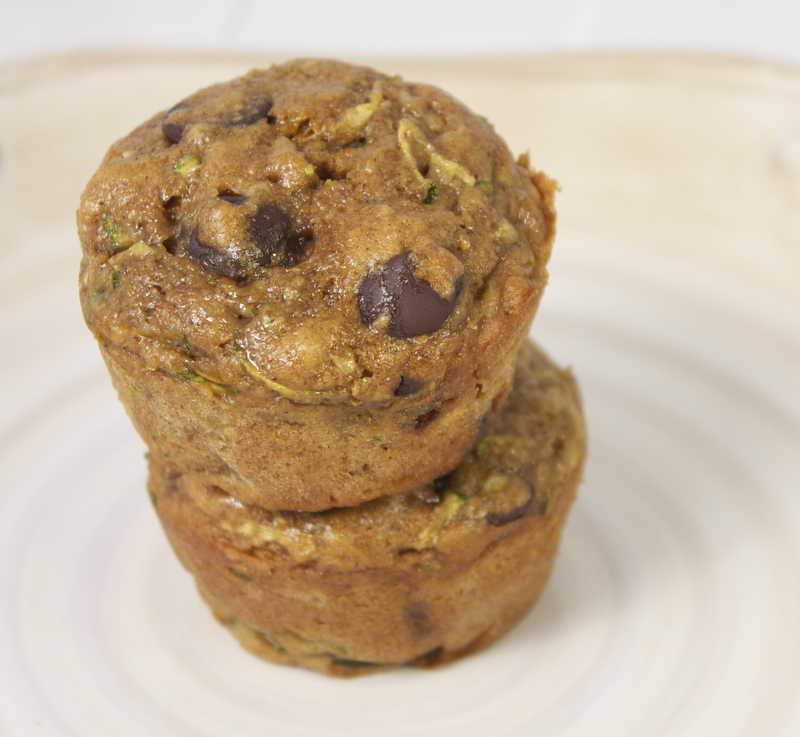 These are the type of muffin that you don’t have to feel guilty about piling onto your breakfast plate…they’re gluten-free, low-fat, and low-sugar, but still super moist, rich, and delicious. My mom, who’s been gluten-free for a few years now and hasn’t had a “cupcake,” as she called these, in forever, proclaimed that these were “the BEST cupcakes” she thinks she’s ever had. Of course, given the amount of time she’s spent away from gluten I doubted she could even remember what a real cupcake tastes like. When I tasted one, though, I ate my words–no pun intended! 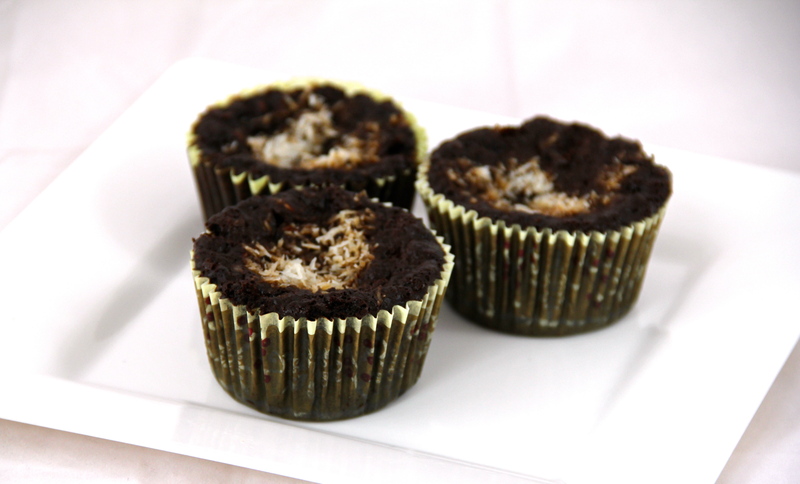 The texture is really more like a cupcake than a muffin, with a fine crumb and a mega-chocolate flavor. The oats add a little chewiness, which I love, and the coconut sugar and sprinkling of coconut flakes give just a hint of tropical flavor. If someone had told me when I was six that I could eat a chocolate cupcake for breakfast, I would have practically fainted with glee. It’s true that you’re totally justified to eat these for breakfast. They’re practically health food. Seriously. Go for it. YOLO. Preheat oven to 350 degrees F. Line 18 muffin tins with paper liners and set aside. In a large bowl, whisk together the buttermilk, egg whites, applesauce, yogurt, and vanilla until smooth. Stir in the oats, coconut sugar, cocoa powder, baking powder, baking soda, cream of tartar, and salt. When incorporated, stir in the chocolate chips. Scoop the batter into prepared muffin tins, filling about 3/4 of the way. Sprinkle batter with shredded coconut and bake for 18-22 minutes or until an inserted toothpick comes out with just a few moist crumbs. Cool and enjoy! November 1st. That dreaded day after Halloween when everyone is either groggy and grumpy from lack of sleep the night before or completely wired from eating an obscene amount of candy. Having two parents as teachers, November 1st is a somewhat dirty word in our house. Or, uh, two words that is. I blame my overtired, post-Halloween brain…hey, case in point! 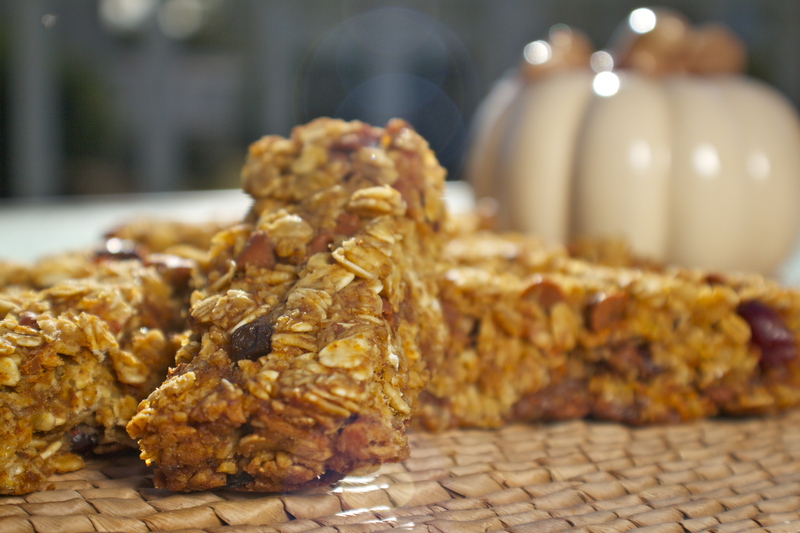 These granola bars are a perfect pick-me-up for days like today. 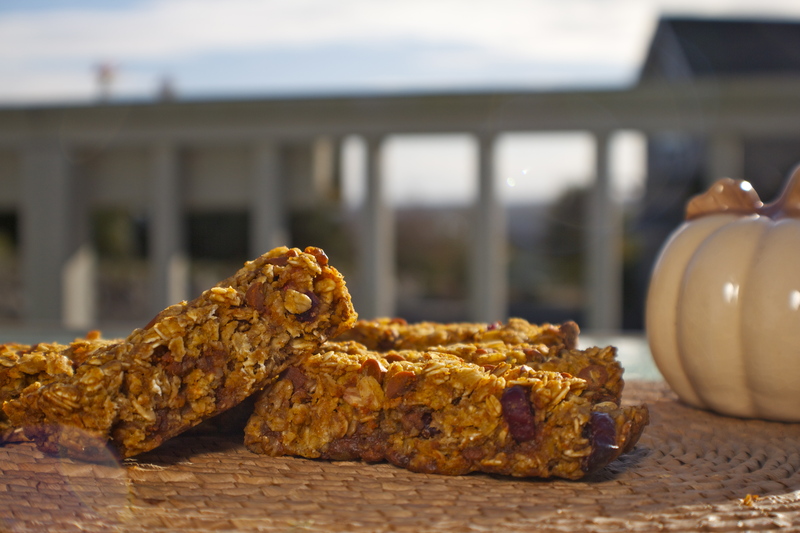 Full of oats, pumpkin, fall spices, maple syrup, cinnamon chips and dried cranberries, there’s nothing not to like. Not to mention that they are waaay cheaper than buying a box of granola bars that are probably full of preservatives and ingredients that I can’t pronounce, unless you want to the buy the even more expensive healthy type. Sorry, store-bought granola bars. I’ve got nothing against you, I promise, but you’ve got nothing on these homemade guys! Sorry. Preheat oven to 350 degrees F. Spray an 8″x8″ baking pan with cooking spray and set aside. In a large bowl, whisk together the oats, cinnamon, pumpkin pie spice, nutmeg, and salt. In a medium bowl, whisk together the brown sugar, pumpkin, applesauce, maple syrup and vanilla until smooth. 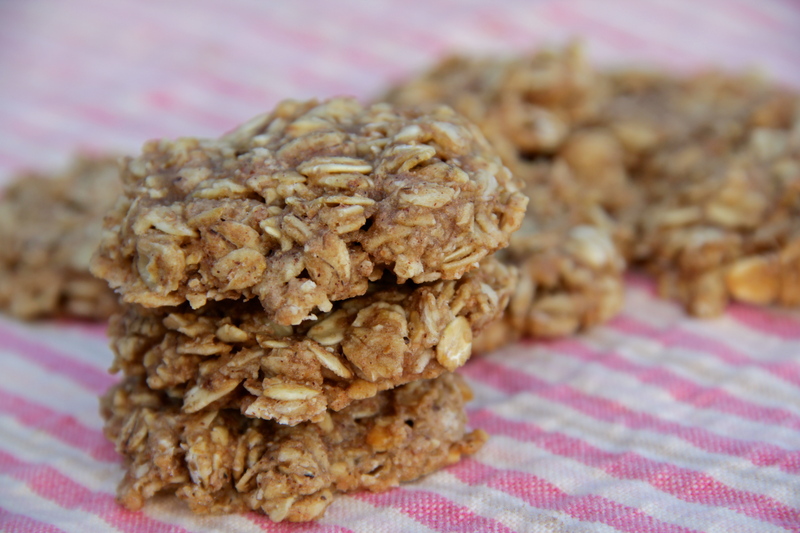 Using a rubber spatula, fold the wet ingredients into the oats until well-combined. Stir in the cinnamon chips and cranberries. Evenly press the mixture into the prepared pan. Bake for 35-40 minutes or until golden-brown and firm. Allow to cool completely before cutting into bars. Bars can be stored for several days in an airtight container at room temperature. Sadly, I had to make do with the single skinny apple tree that grew next to our patio. After living in our house for seven years, we finally determined its unwavering pattern. Every other summer, the tree would burst with bright pink apple blossoms that ripened into little, green, surprisingly edible apples in the fall. I loved going “apple picking,” though it was usually about 5 minutes and 6 apples later that the apple picking of the season drew to a close. However small our tree’s bounty was, there was still almost always enough for an apple pie. A big piece of homemade apple pie had an uncanny ability to erase my yearns for that lemon tree! The following year, however, always proved to be a disappointment. For some reason our tree had a switch that turned on one summer and off the next. Without exception, that little apple tree could only handle the strain of producing apples every other year, so every second summer I would gaze sadly up at the spindly, bare branches and wait patiently for the following summer, when it would magically come back to life. I haven’t lived in that house for nine years, but I wouldn’t be surprised if our determined little tree was still chugging (every other year, that is)! Ironically, our house on the island is also home to a little apple tree, though it’s even weaker than the first. To get the apples that I can’t reach, all I have to do is stand under the branches and shake the trunk (yes, the trunk!) and the ripe ones will fall down. Sometimes right on my head, but that’s beside the point. As small and scrawny as it is, this little tree is just as determined as our old one. It manages to produce a few dozen Granny Smith-esque apples every. single. year. *Gasp* I went out the other day and came in with twenty-two apples, so I decided some baking was in store! 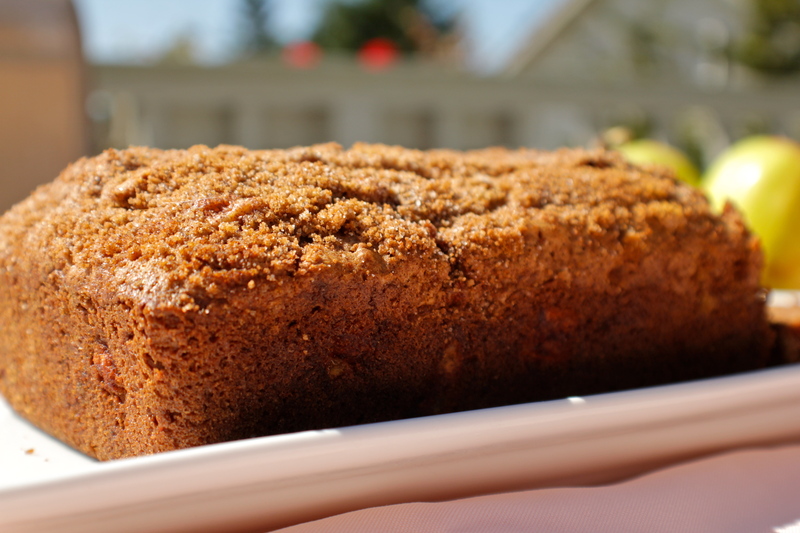 Enter this Apple Cinnamon Bread, which is full of fall flavors: cinnamon, a touch of allspice and cloves, and tart chunks of homegrown apple. Add a crunchy brown sugar-cinnamon topping and you’ve got a winner! Preheat oven to 350 degrees F. Spray an 8″x4″ loaf pan with baking spray. Set aside. In a medium-sized bowl, whisk together the flour, baking soda, salt, cinnamon, allspice, and cloves. Set aside. In a large bowl, beat the eggs for about 30 seconds. Add in the oil, applesauce, and vanilla and beat until well-combined. Add in the cup of sugar and mix until smooth. Gradually add the flour mixture to the wet ingredients, mixing just until incorporated. Using a rubber spatula, fold in the diced apples. Spread batter into prepared pan. In a small bowl, combine the brown sugar, 1 Tbs granulated sugar, and cinnamon. Sprinkle the mixture over the batter in the loaf pan. Bake for 50-55 minutes or until edges are golden-brown and an inserted toothpick comes out clean. Let the bread cool in the pan for 10 minutes before removing onto a wire rack. Cool completely before slicing.